On March 9thRosenthal will be releasing his debut EP Heartvia AfterImages. Last year this singer-songwriter released two singles in Lashes and Afraid of Stairs which had the blogosphere fluttering like tiny little butterflies because of how lush sounding and good they were, so this year he will be looking to not only continue his momentum but also expand it into an even bigger level with debut EP. The title track from the EP is currently available to listen to and it’s clear to hear exactly what made the blogosphere turn into butterflies. Heart features some gorgeous sounds in acoustic guitars which have been caked in reverb to create this incredibly haunting but cascading atmosphere which is backed up by a simple drum beat and additional melodies which all seep into one another to create one big hunk of loveliness. However there’s no sense of direction, it’s as if Rosenthal has set up a campfire and started playing guitar but the fire’s slowly burning out. There’s no real climb towards anything, and the very slight attempt at a build up immediately turns to silence as the track ends. It really would have been nice for Heart to have gotten a chance to build up to something that has one hell of a payoff. A gigantic flurry of acoustic guitars and melodies would have been perfect, especially with Rosenthal’s sound and production quality. Despite the negatives Heart did bring some promising elements into 2015 and in some sense we are looking forward to hearing more from Rosenthal, the butterflies can’t have been wrong. 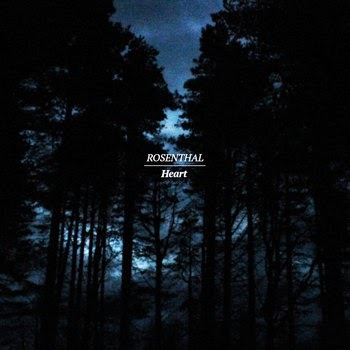 The Heart EP will be released March 9th, so we should expect to hear at least one new track from Rosenthal that should hopefully exceed everything the title track did for us today. For more music reviews, free downloads and a chance to win a free new best friend for life check out Exploding Head Syndrome on Facebook and Twitter.